Camera is still out of commission at the moment, but once it’s back, there will be a seed starting update, because it is ON in those trays. Our grow light set up seems to be paying off. In the meantime, here’s what I’m reading this week. This article contains the graphic photos and facts that most people ignore when they purchase and/or consume animal products from factory farms, and in that regard it’s worth a look. But it’s also part of a series of articles sponsored by Chipotle. And even though Chipotle has made strides in its treatment of animals that it uses for its restaurant and the removal of unnecessary antibiotics, their meat still primarily comes from factory farms. So this one is complicated. Would you like to walk out your front door to find a layer of manure on your car? Yeah, me either. It’s amazing to me how biotech companies are so scientifically advanced yet forget that nature evolves. Three quarters of our corn crops are genetically modified to be resistant to rootworm damage. Now the rootworm eats the corn for dinner. Some interesting ideas on how we can make sustainability work on a large scale. Did you know 95% of milk in the EU is from grass-fed cows? While I’m finishing up my latest book for review and staying warm through Polar Vortex Round 2, here are some other good reads from around the web. Fascinating look at the chemical spill that recently contaminated the water supply of more than 300,000 people by a very engaging science writer, Deborah Blum. Drives home the idea that our system of “use it until it hurts someone” is a dangerous gamble. Doug Rauch, a former Trader Joes president, is opening a store called the Daily Table, where food past its sell-by date and produce seconds (bruised or blemished fruit and vegetables rejected by regular stores) at a major discount. I think this idea rocks – since we know that sell-by dates have nothing at all to do with whether or not a food is safe to eat. John Deere and Monsanto are (separately) offering programs to farmers where they can submit their data on their farms through the use of GPS-type devices – what they plant, what they are doing, how much is harvested of what crop in what location, etc. In return, the companies would promise to give them feedback about efficiency and the best uses of seed and soil. But at what cost to their privacy? Some great reads from around the interwebs. Also, I often tweet links to stories that are especially important to me, since it’s faster than waiting to compile them for a post. So follow me on Twitter if you’re interested in food journalism or are a news junkie like me. I’m not at all surprised by this. The growing threat of antibiotic resistant bacteria is only one of the threats posed by overuse of triclosan and antibacterial products. In 2013, we switched to Honest products at home, and their handsoap doesn’t contain triclosan. Sometimes soap and hot water is the best way to prevent the spread of harmful bacteria (without the hormone disrupting side effects. It will be interesting to see how this shakes out with the FDA. Totally fascinating new concept called development supported agriculture – residents sharing farms and agricultural production. Would make for an interesting HOA, that’s for sure. For all those who think soy is the great savior of food – a lesson about what Big Soy does to the environment and agricultural workers. A great round-up post of the large issues in food policy that captured the nation’s attention in 2013. Includes the battle over GMOs (which is far from over), labor, bees, nutrition and even antibiotic-resistance. Really interesting article about ways to save food that would otherwise be wasted. This is no small feat – but these groups are doing amazing work. One group has saved over 300,000 pounds of food so far! Whole Foods is introducing new ratings for their produce and flowers, similar to those used for their meat products. The model is a “good,” “better,” “best system. I really appreciate that these labels won’t just take into account the environmental conditions under which the products are grown, but also the treatment of those people who grow them and harvest them. I’m a huge fan of transparency, and Whole Foods is a leader in this regard. A group of scientists and physicians released a statement asserting that no scientific consensus has been reached on the safety of GMOs. This is important because many groups are using “science” to back up their positions about the safety and/or danger of GMOs. I actually think that one of the best arguments for GMO labeling is exactly this – we don’t KNOW what GMOs do. So until we do, shouldn’t products be labeled? The FDA has proposed eliminating artificial trans fats, a major known contributor to heart disease. They’d eliminate them by removing the “generally recognized as safe” label and requiring companies to prove they are safe, which is unlikely considering the medical evidence. It’s being lauded as a big step in public health, and it is, but knowing the FDA, it seems like anything can happen. I’m still processing all that I learned and saw at the Mother Earth News Fair, but look for recaps on that soon. In the meantime, here’s what I’ve been reading this week. The USDA recently changed the process of exempting prohibited substances in foods labeled as organic, without having any public comment period. Previously, prohibited substances were given five year periods in which they could be exempted, while alternatives could be found. After that period, they’d expire unless a two-thirds majority of the National Organic Standards Board allowed it, AFTER a public comment period. Now, all of that has been erased and these substances can be allowed indefinitely, and with no public comment period, outside of the public view. Not only does it weaken the already relatively weak organic standards, but it pulls more of our food processes behind closed door and decreases transparency. A great infographic on how antibiotic resistance is created, plus links to other stories explaining the issue. A Washington state farmer’s alfalfa crop has been found to contain a GMO trait, which has stopped him from being able to export it (as European nations have much more strict laws regulating GMOs than the U.S.). How this plays out will be interesting, though I’d venture to guess the government will not go out of its way to protect the farmer. A really interesting take on food pantries from someone who runs one. What he does? It’s my dream job. I was asked once in a job interview what my dream would be, and I said if I had capital, I’d open a food pantry that was a community garden and had cooking and gardening classes. To help people get on their feet and empower them to make good choices. Edible Allegheny is a local magazine that, as their tagline says, “celebrates local food, farms and cuisine – season by season.” I actually started reading the magazine several years ago, when a free copy was included in a delivery of produce I got through a program at my old job. That was around the time I was becoming a food person anyway, and the recipes and stories were inspiring and educational. I can honestly say that Edible Allegheny is responsible for Mark and I finding a ton of great restaurants and food events in the area. They are a great resource for all things local food – truly covering everything from the farm to the table. I’m really excited to be one of the featured blogs in the Online Dish column this issue, along with two other great local sites: food blog Life and Kitchen and agricultural blog Write to Farm. Head over to this month’s column to read about this blog and its roots, as well as the other great local links – the website is a wealth of information and the Online Dish archives can lead you to some great local blogs as well! 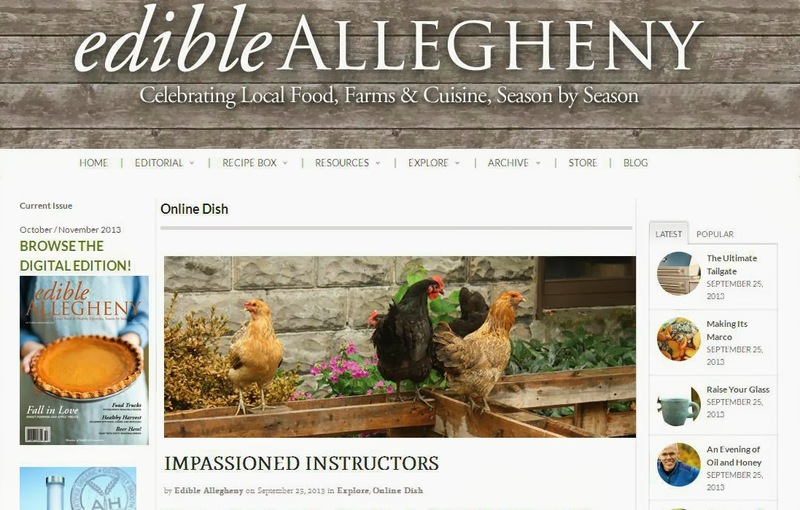 I wasn’t paid or perked to promote Edible Allegheny – they are just a great magazine. Here are some of the things I’ve been reading and pondering lately. Check these out! A Michael Moss piece about what behavioral scientists are doing to nudge you into the produce aisle. Would you be more likely to buy healthier foods if you saw your reflection in your shopping cart? If you agree that pesticides are not something you want to ingest, you probably agree that you shouldn’t be sprayed with them either. Farmworkers deserve protection from these hazardous chemicals too. This is from June, but still funny. Interesting video about the sheer amount of waste our country produces. A Mark Bittman piece on antibiotic resistant pathogens from factory farms. This is one of the myriad reasons we don’t eat meat from confined animal feeding operations. There is no reason any of us should be exposed to livestock-associated MRSA. We know how to use household chemicals safely by reading the label on the bottles. But how do you know how to protect yourself on the job when the labels aren’t in a language you understand? Many of our nation’s produce workers speak Spanish as their first language and aren’t able to understand warning labels on the pesticides they use in their work. The Center for Science in the Public Interest is a well-known consumer advocacy organization, but it won’t support GMO labeling. This article explains why that’s a mistake. It’s been a busy week at Next Gen House. This weekend we made a big batch of homemade bolognese sauce using the recipe from America’s Test Kitchen’s Slow Cooker Revolution book. (If you like the convenience of a slow cooker but don’t like to simply dump cans of processed soup and packets of chemical flavor mixes over frozen chicken breast, this cookbook is for you.) We were able to use ground beef and ground pork from our meat CSA with Clarion River Organics. We also canned two batches of strawberry balsamic jam. This is the first year we’ve done a jam with balsamic and now I’m kicking myself for not having used this variant before. You can’t taste the balsamic in the finished product, but it makes the strawberry flavor deepen and burst. It’s similar to the effect that vanilla extract has in baked goods. If you’re making strawberry jam this year, definitely go for a balsamic variant. And also, cool your jars on a Christmas towel. Because it brings some festive cheer to a hot kitchen, apparently. Going back to listening to a food studies book on my commutes, and this morning I started Salt Sugar Fat: How the Food Giants Hooked Us by Michael Moss. It’s riveting already and I’m only 45 minutes in. Here are some other things from around the interwebs I’m reading this week. I’ve read some of these and others are on my reading list. Really looking forward to reading Foodopoly as well as Behind the Kitchen Door, having worked at restaurants myself. An article from last year, but one that backs up my reluctance to consume sports drinks of any kind. When you buy products, look beyond the marketing hype. For example, the photo of the packaged turkey breast in the article: do you actually think someone stood with a white coat and a carving knife at a carving board to shave that off specifically for your sandwich? NO. Great ideas for the summer from a great website and magazine I subscribe to.